Large, ferocious-looking animals called beardogs — neither bears nor dogs — roamed the Northern Hemisphere between about 40 and 5 million years ago. But because so little data on their earliest members are available, their evolutionary relationships or phylogeny — and their place on the tree of life — have remained unclear. A new study published yesterday in Royal Society Open Science and based on improved phylogenetic analysis and advanced computed tomography (CT) scanning has changed that. The research identifies two fossils previously thought to be generic carnivorans (a large, diverse order of mammals) as some of the earliest known members of the beardog family. These fossils are from animals estimated to be no larger than about 5 pounds, roughly the size of a Chihuahua and much smaller than formidable descendants that would later evolve. The work reveals that while evidence of beardogs has been found throughout the Northern Hemisphere, they may have originated or initially diversified in parts of what is now the southwestern U.S.
“Our research pinpoints the southwestern U.S. as a key region in understanding the diversification and proliferation of this once successful group of predators prior to their extinction millions of years ago,” says study co-author Jack Tseng, assistant professor in the Department of Pathology and Anatomical Sciences in the Jacobs School of Medicine and Biomedical Sciences. First described back in 1986, fossils found in Texas of animals believed to be less than 5 pounds originally were assigned to the genus Miacis, a kind of “miscellaneous” category for early carnivores, based primarily on external features. “It was the best that could be done at the time,” says Tseng, who did the work as a postdoctoral fellow at the American Museum of Natural History in New York. Susumu Tomiya, postdoctoral scholar at The Field Museum in Chicago, is lead author on the paper. According to Tseng, the early anatomists based their hypothesis on superficial features like the shapes of the teeth and the locations of cranial openings where the blood vessels and nerves radiate from the brain and other external characteristics, assigning it to the genus Miacis. “It’s a kind of ‘trashbin’ genus, when the question is, well, what else could it be?” Tseng explains. “Now we’ve taken these fossils out of the trashbin and put them at the base of the beardog tree. Tomiya decided to study the fossils when he ‘stumbled’ upon one of the specimens in the Field Museum collection. That closer look included tapping Tseng’s expertise with high-resolution X-ray CT 3D reconstructions of the intracranial anatomy of the fossils. While CT scans of the skull already existed, Tseng conducted a much more detailed and time-consuming analysis through more than 1,000 slices of CT scans of the skull. Adding to the difficulty of examining a very small skull — the whole animal was no larger than a Chihuahua — was the fact that the spaces inside the skull were still filled with rock. 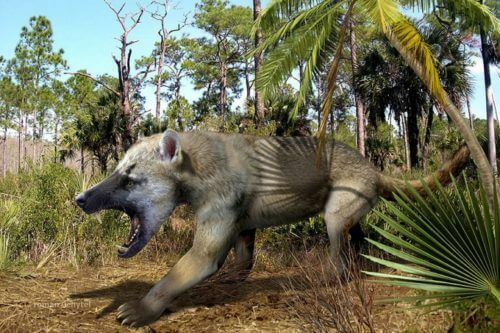 Twenty years earlier, Tseng’s PhD adviser, Xiaoming Wang of the Natural History Museum of Los Angeles County, had speculated that based on what could be seen externally, this animal was likely related to beardogs and may have had a deep embayment — a bone-enclosed space — in the region of its ear. According to Tseng, the ear is very important in understanding mammalian evolution. “The ear can be used to calibrate how species are related,” he says, noting that in other collaborative research he is studying the ear’s bony labyrinth, whose shape may be correlated to the kinds of movements an animal can make. Tomiya’s work conducting rigorous cladistic analyses (classification according to shared features) involved updating the taxonomy of these animals and their evolutionary relationships based on new phylogenetic affinities — in other words, how the beardogs may be related to other carnivores that exist today, such as dogs, bears, raccoons and others.